This map illustrates the satellite-detected surface waters in Binh DinhNam Province, Vietnam, as observed from the Sentinel-1 image acquired on 10 November 2017, following the landfall of tropical cyclone DAMREY-17 on 05 November 2017. 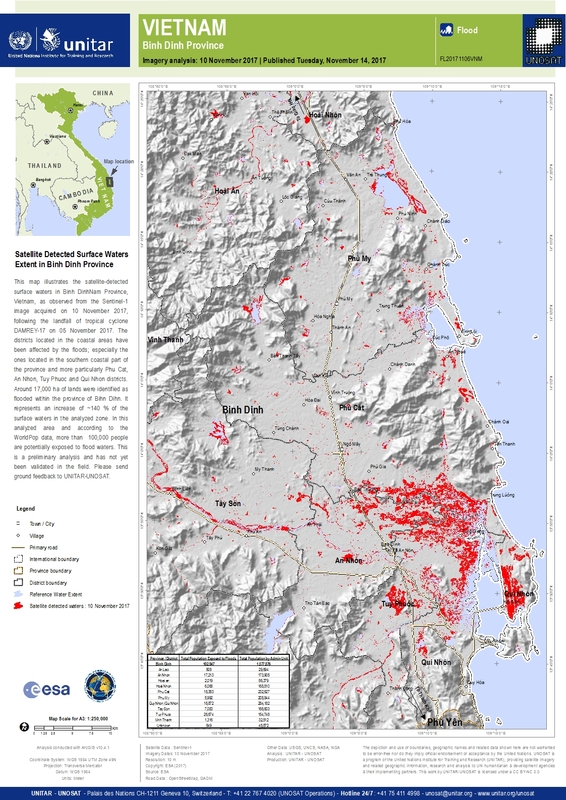 The districts located in the coastal areas have been affected by the floods; especially the ones located in the southern coastal part of the province and more particularly Phu Cat, An Nhon, Tuy Phuoc and Qui Nhon districts. Around 17,000 ha of lands were identified as flooded within the province of Bihn Dihn. It represents an increase of ~140 % of the surface waters in the analyzed zone. In this analyzed area and according to the WorldPop data, more than 100,000 people are potentially exposed to flood waters. This is a preliminary analysis and has not yet been validated in the field. Please send ground feedback to UNITAR-UNOSAT.